Following yesterday’s cruise-centric T-Mobile Tuesday, the gifts and prizes for next week have been revealed. On November 8, T-Mobile customers will get $30 off a HotelTonight booking as well as the choice of a $4 Footlong Autumn Carved Turkey sub or two free cookies from Subway. Also available will be a free movie rental from FandangoNOW. Finally, T-Mobile says that it’ll be holding a “battle of the brands” next week that’ll ask you to vote for your favorites. 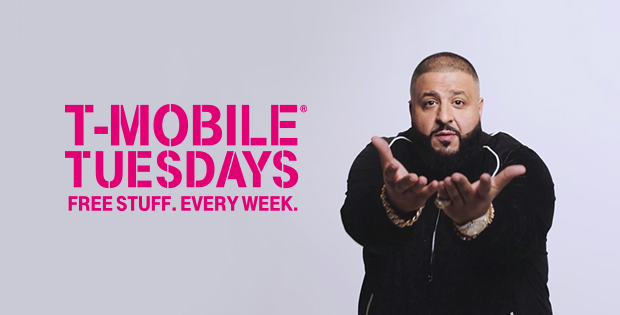 “Who knows, maybe you’ll see them in T-Mobile Tuesdays sometime soon,” says T-Mo. Next week’s grand prize winner will receive a trip for two to Washington, D.C. That includes round trip airfare, two nights in a “high-roller suite” at a hotel, a $2,000 dining credit for that hotel, a $1,000 spa credit, and a $500 movie and mini-bar credit. Also included will be a $1,000 American Express gift card for miscellaneous expenses and a $4,500 check to cover taxes. One hundred first prize winners will get a HotelTonight coupon code for $300 off a hotel booking. Finally, 200 second prize winners will get a $75 HotelTonight coupon code. Who does still care about T-Mobile Tuesdays since Domino’s opted out? Not this guy! Then you missed out on one very sweet t-shirt my friend. And cover up those abs?! But yeah I miss Domino’s. Movie rentals are nice too, catching up on stuff i didn’t see in theaters. Welp… There was Buffalo Wild Wings, Subway, and some free movies. I took advantage. But I definitely remember enjoying Dominos the most. Seriously. Fandango is pretty useless. Do they even have rentals for less than $6? If you pick sd lol. Still only 1 dollar for a rental. I am no longer is interested with the prizes they are offering, so I deleted the Tmobile Tuesday app. Thanks for upping our odds at winning trips! I actually won a dinner and movie ($100 check) three weeks ago, was totally shocked. Just got it in a few days ago. Like chad said, thanks for upping the odds even more. Most of the time TMO Tuesday app gives you error and then saying you have already played. Total crap in the experience. Yay! Pizza’s bac….nvm, it’s just Subway. Use the movie rentals from Vudu and Fandango. Used Lyft once. Got my first Frosty yesterday. Go away Fandango. I like using those credits to buy movies on the cheap. Not to mention that the Fandango Android app doesn’t like pulling in your UV library, so you literally can only use it for the movie you rented, unless you bought movies through FandangoNow. I might have to try that turkey footlong for $4. Its not free, but thats still a good discount. I think its usually $7 or $8 for a footlong. yeah! I need to complete my Game of Thrones season 6! I’ll admit I’m a fatty and I want PIZZA! TMO must be getting more of a kickback & that’s why they switched to Fandango..(it’s not the money, but the principle) You still have to pay 99 cents on top of your rental.. At least with VUDU a free rental was free! I must be missing something. The “free” VUDU rentals always cost me 49 cents because the credit was for $5.50 and HDX rentals are $5.99. Fandago’s user experience is horrendous, but I’m happy that the $5 credit covers the entire cost of a rental. I haven’t had to pay anything extra. A few hdx ones cost 5 or less i think. It’s more than likely me that’s mixed up. I do know that I never have to pay on VUDU.. But these past two weeks when I did the Fandango rentals. I had to pay 99 cents each time.. And I could’ve sworn that it was the standard rental. John Legere said in the uncarrier stream that he doesn’t want to just screw us like the other carriers, he wants to take us out for a dinner and a movie. “That’s right. We just did that. Until further notice, we’re treating our customers to dinner and a movie—all to say ‘Thank you’!” said John Legere. Now Fast Forward To The Present Day: T-Mobile is taking us out for a movie and food, but we have to buy our own meal???? This is a cheap date!!!! Getting screwed by Verizon doesn’t sound all that bad vs being tricked into paying for our own date night. Go ahead and pay double at Verizon. I’m sure John would get over it, cheapo. Verizon does have inflated prices … I will sit in the corner quietly and watch my Fandango Movie… I guess I am a cheapo, but being a cheapo allows me to spend my money on other things for me and my family. They periodically still do have free food. They had the free 6inch subway sandwich not too long ago, and some free buffalo wild wings. Can’t really always give out the best of the best every week, even though that’s basically what he said. I kinda didn’t expect it to stay so powerful for long. Everyone should have expected it to get a little light on what it gives out after it had everyone hooked. It sure did start out great though. Free pizza was awesome. Thanks TMobile for giving back to your customers. I’m not one to complain about free stuff, but this FandangoNow choice is more of a pain to me as I try to switch between logins on Roku, lol! I wouldn’t doubt it if T-Mobile wasn’t paying anything for T-Mobile Tuesday’s and getting the vendors to pay a fee to advertise to their wireless subscribers. I’ve read in many places that T-Mobile pays none of this. The actual brands themselves are offering this stuff and getting it out as practically free advertising. Except the Wendy’s frostys. It says right in the app they donated $500,000. “no free food” ruins your Tuesdays? Gee, I wonder what will ruin your rest of the week? Did anyone else get a 10 cent fuel reward for Shell gas from TMobile on Tuesday because i did. I remember they ran a promo with them 2 months ago for one Tuesday and i never got another promo for Shell gas until this past Tuesday and it wasn’t advertised as one of their Tmobile Tuesday prizes. I just happen to get a notification from the Shell Fuel Rewards app that i earned 10 cents off per gallon from Tmobile Tuesdays to be used by November 2.
i get 3cents off when i go to murphys usa to get gas (thanks tmobile)…. and my neighbor baked me a cake yesterday T-Mobile Wednesday is better than T-mobile Tuesday.